Forty years ago today, Air Force Sergeant Leonard Matlovich appeared on the cover of Time magazine, marking a turning point for LGBT Americans in the military. He was one of the first gay men in the military to publicly come out and to speak out against the military’s discriminatory ban. He was subsequently discharged. As a Vietnam War veteran and a recipient of the Purple Heart and Bronze Star, Matlovich’s bravery made headlines and gave a face to an issue many Americans were still learning about. In addition to being the first gay man in the military to publicly come out, he was the first openly gay person to appear on the cover of a U.S. magazine. 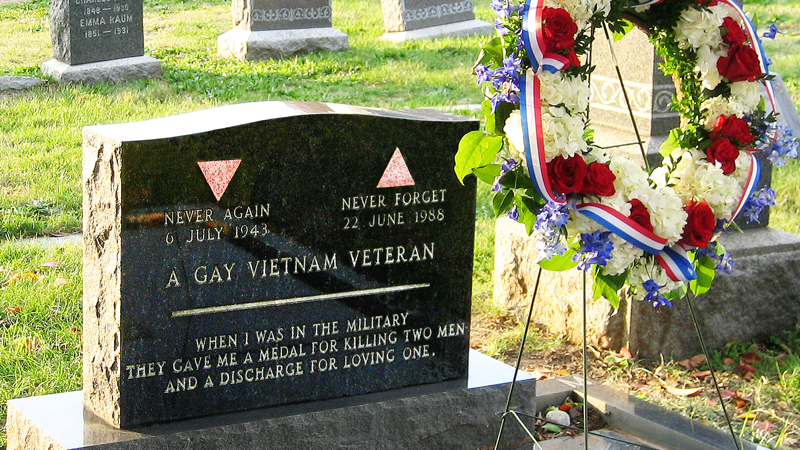 Matlovich was one of 114,000 service members that were discharged from the armed forces because of their sexual orientation between World War II and the repeal of “Don’t Ask, Don’t Tell” in 2011. While “Don’t Ask, Don’t Tell” was repealed in 2011, transgender service members are still forced to serve in silence, much like Matlovich did, because of outdated medical regulations. The military made news earlier this year when the Pentagon announced that it will lift the ban on transgender Americans in the military. There are still approximately 15,500 actively serving transgender members of the U.S. military who are unable to live their authentic truth. Photo (c) AJ Loop/ Wikicommons.